Although grapes don't make the "top eight" allergy list like more common allergens, such as milk, wheat and nuts, kids can develop a grape allergy. However, your child may not have a grape allergy but a reaction to other substances on the grapes. 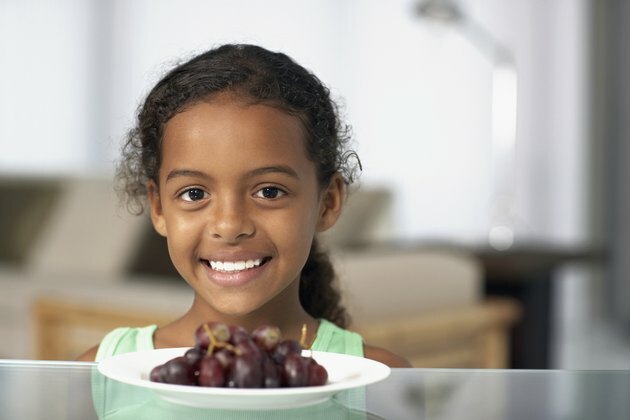 If you think your child had a reaction to grapes, see his doctor for allergy testing to determine the exact cause. Cross-reactions to others foods can also occur. Proteins in foods cause allergic reactions. Although you may not think of grapes as a food that contains protein, one cup of grapes contains 1.09 g of protein, enough to cause an allergic reaction. The proteins thought to cause allergy in grapes include three specific proteins, a grape lipid transfer protein, endochitinase 4A and a thaumatin-like protein. The main protein allergen in grapes is LTP, Greek researchers reported in the January 2007 issue of the "International Archives of Allergy and Immunology." The immune system overreacts and responds to harmless substances, like proteins in foods, and in allergic people produces antibodies that release substances that attack the allergen. Grape allergy can cause symptoms similar to other allergens. Reported symptoms from grape allergy include hives, cough, rash, wheezing, runny or stuffy nose and asthma. Oral allergy symptoms include swelling of the lips, throat and around the mouth, itching in the throat and irritation of the gums or eyes. Anaphylactic symptoms include low blood pressure, hives, facial swelling and swelling of the throat, breathing difficulty or wheezing. What appears to be an allergy to grapes could actually be an allergy to mold or yeast that grows on the grapes or to pesticides used on the grapes. Lipid transfer proteins found in both grapes and peaches can also cause cross-reactions between the two fruits, according to a study conducted by Italian researchers and reported in the February 2003 issue of the "Journal of Allergy and Clinical Immunology." A cross-reaction between cherries and grapes can also occur. Oral allergy syndrome causes a reaction between fruits and other substances. And a cross-reaction between latex and grapes can occur, according to Michigan Allergy, Sinus and Asthma Specialists. It's possible to have an allergic reaction to one type of grape and not to others, the AllAllergy website explains. It's also possible that an allergy to one type of grape can mean an allergy to all grapes, raisins and wine products. If your child has a reaction to one type of grape, do not give him any other grape products until he has been tested for allergies.